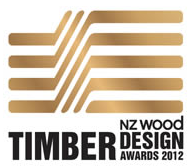 "New Zealand's only Timber Design Awards achieved a massive jump in entries this year, reflecting the desire of professionals to differentiate themselves and their practices from the rest," says NZ Wood CEO Jane Arnott. "Winning an NZ Wood Resene Timber Design Award provides a competitive edge that is compelling in a marketplace that values expertise. The Awards cater to such expertise, and they help draw a line in the sand between mediocrity and brilliance. In these tough economic times, what better way to do this than to put your work forward to be judged alongside your peers," says Ms Arnott. 2012 attracted 93 entries across the nine categories - more than three times the number in 2011 and a record in the more than 30 year history of the Timber Design Awards. Of these, 38 have been selected for second stage judging which requires the entrant to provide greater detail. Not every architect, architectural designer or engineer has the ability or inclination to create practical, safe, cost effective yet dramatic homes and commercial premises in wood. Wood as a construction material offers a level of versatility and texture that can be inherently challenging to today's designers. Understanding the beneficial properties of wood (including its resilience in earthquakes, its acoustics, structural strength and sustainability can be the domain of a new breed of professionals. Deciding to use indigenous timber to create dramatic and warmly special and often carved impacts is another unique consideration that only comes with wood. "Highly skilled practitioners relish using wood because it can develop their own professional skills and meet their client's wishes - we commend them and will promote the winners strongly once they are announced in October," said Ms Arnott. The judging panel of Pip Cheshire (Cheshire Architects), Duncan Joiner (Chief Architect, Department of Building and Housing), Ross Davison (Law Sue Davison, civil and structural engineers), identified 38 entrants as finalists, after weeks of assessing each entry against the category it was entered in. "Advances in engineered timber for large commercial and multi-storey buildings were evident in the Engineering Excellence and Canterbury Rebuild categories, with some world-leading examples being entered," according to judge Ross Davison. Finalists are expected to submit their second stage entry by Friday 7 September, and winners will be announced at an awards ceremony on Tuesday 9 October at MOTAT Aviation Hall in Auckland. Minister of Building and Construction Hon Maurice Williamson, will be officiating. The 2012 NZ Timber Design Awards are proudly sponsored by Resene, and category sponsors include Mainzeal Living, Hunterbond/Nelson Pine, Opus, Southern Pine Products, decortech, BNZ, Lindsay & Dixon, Lane Neave and Scion.